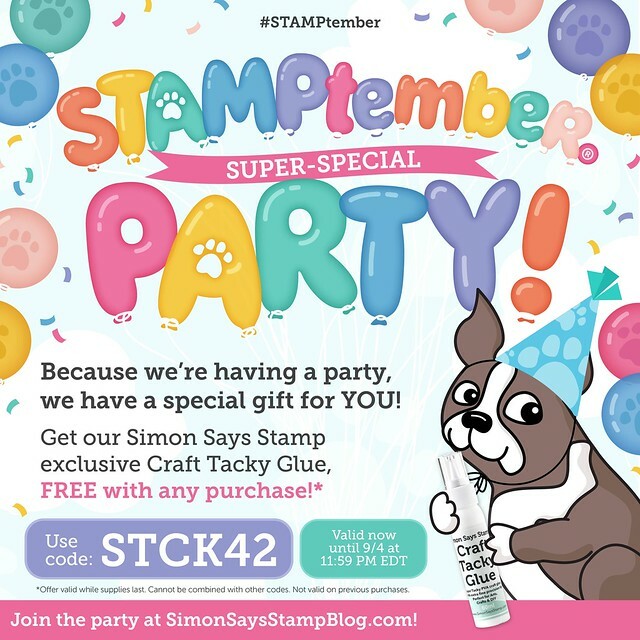 Exciting to share Simon Says Stamp’s STAMPtember has officially started! 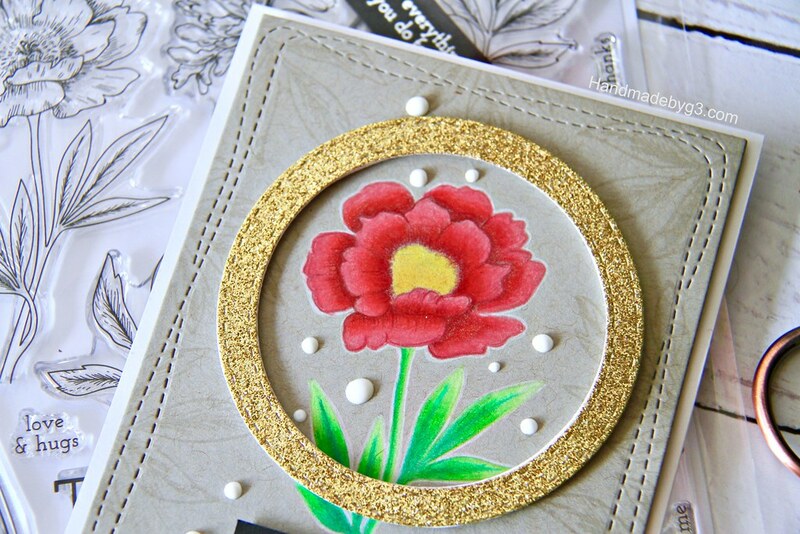 The month long event with Simon Says Stamp has kicked off and I have a card to share with you using one of the newest release stamp set from STAMPtember called Beautiful Flowers 2 stamp set. This is a bigger 6×8 stamp set with a large floral cluster as well as individual leaves and flowers with stems like the one above. On my card above, I used one of the single flower with stem from the set and did no line pencil colouring using Faber Castell’s Polychromos. Then I used the individual leaves from the stamp set to stamp around the coloured image using tone on tone colours. Since the paper is grey, I used Fog ink to stamp the leaves. So there is some interest on the background but not too much that it interferes with the main image. I die cut this panel using the Wonky Stitched Rectangle die. I wanted to highlight the coloured image. 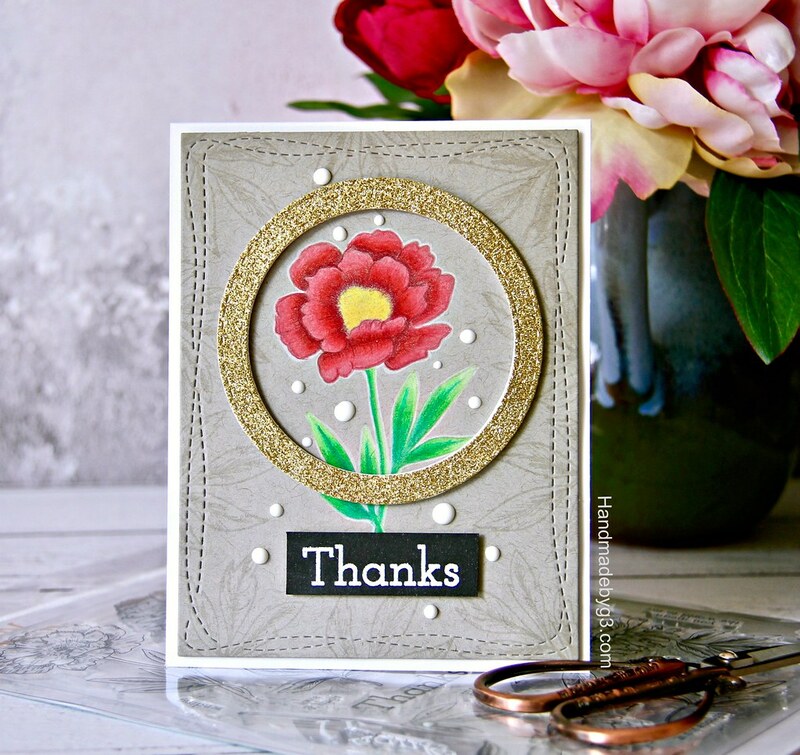 I used two stitched circle die from Simon to die cut a frame using gold glitter cardstock and two white cardstock. Stacked and glued them all with gold glitter on top. 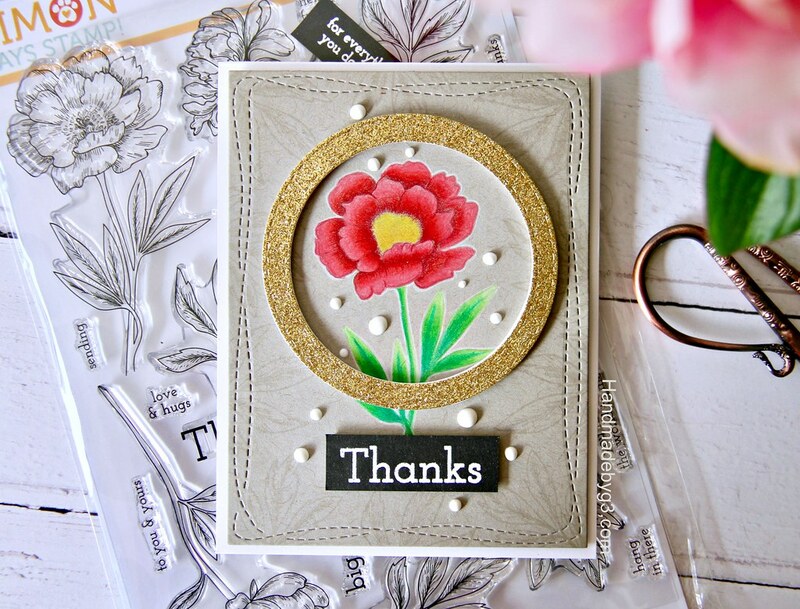 I adhered this circle frame as shown so the focus is now on the coloured flower. For the sentiment, I white heat embossed the sentiment from the stamp set on a strip of black cardstock and adhered using foam adhesive. The completed panel is adhered on white card base using foam adhesives and I finished the card with a scatter of few Nuvo white crystal drops. This is my first time no line colouring using colour pencils on florals. I am happy with how this turned out. I cannot wait to colour the big cluster. All the supplies used to make this card are listed below. All the new release STAMPtember products are now available at Simon Says Stamp store. 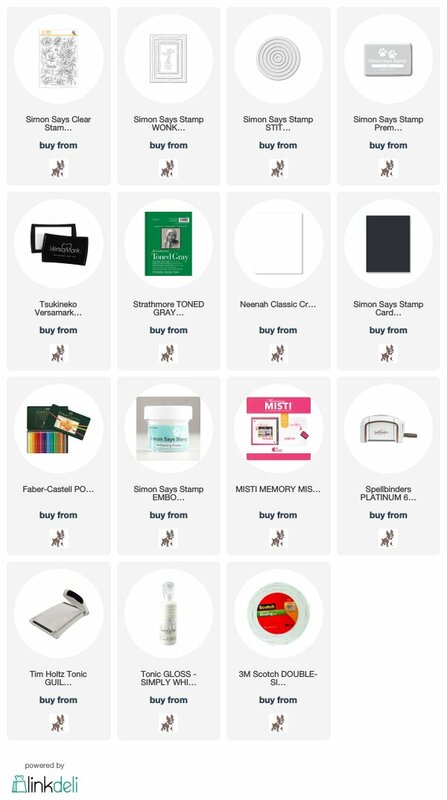 I have special gift promo code with your STAMPtember purchase below. Join me and other designers for huge party tomorrow! 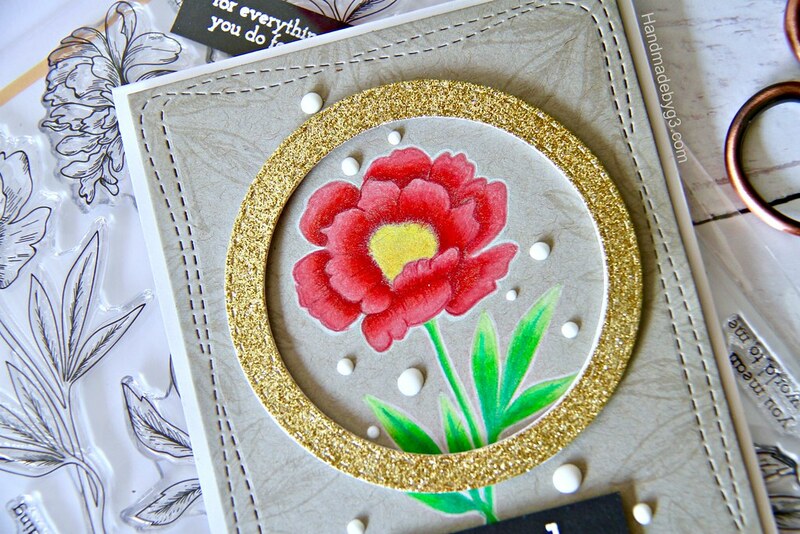 love the beautiful flowers stamp set. thanks as always for sharing.